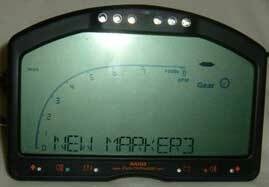 How do I set up lap/sector timing on the DASH2? To use the lap timing functions on the DASH2, the unit must be connected either to a DL1, or a DL2 data logger. 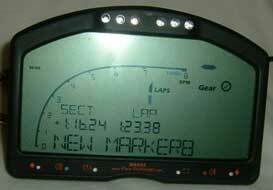 The data logger must have a GPS lock and must be logging data for the lap timing functions to work. To gain information on sector times, markers need to be added to the track. These markers can be added either by setting up a button on the DASH2 to add a marker (this is achieved by using a dedicated button connected to the data logger), or by adding them to data using the Race Technology Analysis Software and saving the resulting .LAP file to the memory card for transfer to the data logger. step 1: The UP, DOWN and SELECT buttons may be programmed to add lap and sector markers. To do this, locate the "EDIT BUTTONS" function on the DASH2s' main menu, and press select. step 2: You will now be asked to press the button whose function you wish to edit. Hold down the menu button and then press the button that is to be edited, releasing both at the same time. step 3: The screen will now alter to show that the button has been selected. The current function of the button will be displayed at the bottom on the screen. Use the UP and DOWN buttons to arrive at the "ADD MARKER" function, and then press SELECT. step 4: Return to the normal display screen. now, when you wish to add a marker, simply press the button that you chose to act in this function. N.B. The first marker added will always be the lap marker. step 6: Lap and sector times may now be read on the screen. step 2: Enter the "File" menu in the top, left hand corner of the screen. Now go into the "Advanced Load/Saves" sub-menu and select "Save Markers/Sectors". step 3: You may now save the Markers and sectors onto a memory card. In order to be recognizable, the file name must be written in UPPERCASE letters, there should be no more than eight characters before the decimal point, and the file extension must be ".LAP". step 4: Once the file has been saved, remove the memory card from the computer and insert it into the DL1/DL2. N.B. It is advisable not to have multiple .LAP files with similar marker locations in this directory, as there is a possibility that the data logger will select the wrong lap marker file if multiple .LAP files are present.